DragonPlate Veneer is capable of forming to a cylindrical diameter as small as 1 inch! 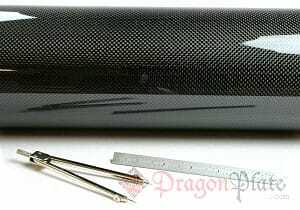 DragonPlate Carbon Fiber Veneer can be easily cut with shears or heavy scissors and can be sanded to produce a smooth edge. Our carbon fiber veneers come ready to install with contact cement; or for quick and easy installation, we optionally offer a veneer with high quality 3M self adhesive backing, already affixed. Simply peel and stick! See how easy it is to install. If you’re going to spend money on carbon fiber veneer, why settle for anything less than the best! Plain Weave Carbon Fiber Veneer 12" x 24"
Plain Weave Carbon Fiber Veneer 24" x 24"
Plain Weave Carbon Fiber Veneer 30" x 80"
Plain Weave Carbon Fiber Veneer 48" x 48"
Plain Weave Carbon Fiber Veneer 48" x 96"